Chemistry Stores stocks more than 200 chemicals, deuterated solvents, dry ice, reusable and disposable glassware, plasticware, safety products such as personal protective equipment and spill control products, filtration products, assorted tubing, pipettors, and other miscellaneous scientific supplies. 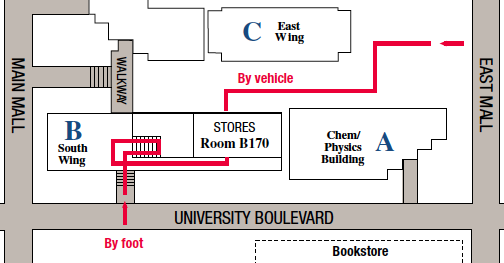 We are located on the lower floor of Chemistry B Block, South Wing, Room B170 - 2036 Main Mall (see map below or go to Wayfinding at UBC: Chemistry Block B, Room B170 - 2036 Main Mall). Anyone holding a UBC account can set up a standing account at Chemistry Stores with a valid journal voucher. Our customers must have an account within the UBC Finance system. Chemistry Stores offers a limited range of non-chemical products for sale by credit card to the public. Please contact Elan or Xin-Hui below for more information. Closed on UBC recognized statutory holidays. Due to ongoing construction vehicle access is via Agricultural Road, then walk between Chem D and Hennings, and go inside/through Chem C. For small deliveries or pickups please park at the Bookstore and walk over. Enter through Chem Phys (Chem A) and follow the hallway through to Chem B. Standing accounts can be set up by anyone having a UBC P/G within our finance system. At this time we do not sell to anyone outside of the UBC account system. These instructions only apply for accounts from outside the Department of Chemistry. Fill out a Journal Voucher (JV) per instructions below and deliver the signed top (pink) copy to Chemistry Stores. The standing account will be entered in our system and purchases will be allowed during the current time period: April 1, 2019 to March 31, 2020 (Fiscal 2019/2020). New Journal Vouchers will be required for the next fiscal year. These can be brought to Chemistry Stores as early as March 1, 2016. Write here “Standing Account for Chemistry Stores” and provide an expiry date. Please put the grant holder as the first name on the list of authorized users. List the authorized users who will purchase items. If there is not enough room, put list in Description field mentioned in #5 below. In the field called Account, please use only 651169 (Supplies – Stores Stock). Please fill in the Fund, DeptID and Project/Grant fields. Mailing address should go in "Deliver to"
Sign, print name and include the date. (Optional) Add a restriction to what can be purchased by authorized users. Examples: dry ice only, liquid nitrogen only. List of authorized users if it did not fit at top of page. Please note that the email or fax must be sent by either the grant holder, or the contact person for that particular Journal Voucher. If you do not wish to set up a Standing Order, but expect to only purchase items on a one-time basis, you can use a Journal Voucher for a single purchase. Fill out the JV as you would for any other use, making sure it is signed by the grant holder and specifies Chem Stores in the Purchased From field. Solvents will be dispensed into stainless steel containers or CSA approved plastic safety cans (gasoline jerry cans), provided by the customer. If you do not have these containers, only ethanol can be dispensed into a 1L glass bottle (which can be purchased from Chemistry Stores). Fire regulations prohibit us from dispensing into larger than 1L glass bottles. If you want any of the others solvents consider purchasing the HPLC grade solvent in 1L (or 4L for Ethyl Acetate) containers which we also stock. Or consider purchasing safety containers from standard scientific suppliers. Empty containers must be dropped off before 11:30 am to be filled that same day. Filled containers can be picked up after 1:00 pm. When picking up a container of ethanol, please bring a signed Ethyl Alcohol Dispensing Request form. The form can be printed : Ethyl Alcohol Dispensing Request PDF, or obtained from Chemistry Stores when you drop off your container. Please note: Person picking up solvent must be an authorized user on the Journal Voucher/Speedchart used to purchase the solvent. Dry ice is available in Room B162 by self serve. Customers must have a standing account at Chemistry Stores to collect dry ice. Bring insulated container to Chemistry Stores, use scale to determine tare weight of container. Collect cryo gloves and key from Chemistry Stores. Walk to end of hall, unlock dry ice room (B162). CAUTION: Always keep door open while collecting dry ice. Wear cryo gloves, collect amount of dry ice required. Options are 10lb slabs or small nuggets. Return to Chemistry Stores, replace key and gloves. Weigh full container, subtract tare weight to determine weight of dry ice collected. Find your PI’s name/speedchart in the binder, clearly print the lbs of dry ice collected, the date and your signature. If you require more than 15lbs of dry ice on any given day, please place an order two days before you would like to pick up. Fill out the Dry Ice Order Form and drop it off at Chemistry Stores with any of the salespeople. Or fill out the form in person at Chemistry Stores. Customers should not remove dry ice bags from B162. They are reused. Chemistry Stores has a shipping service that is available to all UBC account holders. This service will provide courier and freight services as well as proper documentation for the shipping of most types of goods including vendor returns, repairs and hazardous goods. A handling fee will be charged to JV customers. Please fill out either the Chemical Shipping Form or the Chemical Shipping Form for JV Users. For all international non-hazardous chemical shipments, including those to the U.S., a letter of compliance must be included. Please see attached letter outline for proper wording of the letter. In addition, ALL chemical shipments to the U.S. must also have a TOXIC SUBSTANCE CONTROL ACT PART 707 (TSCA) CERTIFICATION (TSCA) form included. Due to the sensitive nature of goods being shipped on dry ice, please contact Shipping Dept. 24 hours prior to shipping. Fill out the Non-Chemical Shipping Form. Once the necessary forms are complete, please bring them and your shipment to Chemistry Stores Shipping Department and talk to one of our shippers. If no one is available, please leave direct contact information. Soiled lab coats can be dropped off in the bin at Chemistry Stores to be laundered. Customers must have a standing account with Chemistry Stores to have coats cleaned. JV customers must fill out and bring the Lab Coat Laundry Request form at time of drop off, one form per lab coat. JV customers cannot drop off lab coats without this form. Also check that you have an active standing account at the time of drop off. If you work with biological materials, coats must be autoclaved before dropping off for laundering. Make sure we can identify the owner of the lab coat easily. Coats are picked up once per week (usually Tuesday). The cleaned coats are returned about two weeks later. Once ready for pickup from Stores, the group will be notified by email and coats will be placed in the package pickup area in the chemical room. The charge for cleaning is $3.00/lab coat. Chemistry Stores will not be responsible for lost or misplaced lab coats. Applied Biosystems™ instruments and reagents have been trusted in the lab for over 20 years by the world's top scientists. Researchers who demand efficiency, accuracy and gold-standard technology use Applied Biosystems™ integrated systems for sequencing, flow cytometry and real-time, digital and end point PCR—from sample prep to data analysis. Invitrogen™ instruments and reagents are some of the most-cited products for genetic engineering, amplification, purification, quantification and analysis. From TOPO™ Cloning Kits and high-quality SuperScript™ and Platinum™ enzymes, to Dynabeads™ separation technologies and GeneArt™ Gene Synthesis, Invitrogen™ cell and molecular biology technologies are designed to help ensure that the time you invest in your research is efficient and is rewarded with the reliable results you’re counting on. On UBC campus we operate a Supply Centre which is stocked with the hundreds of items that the research community uses most often.